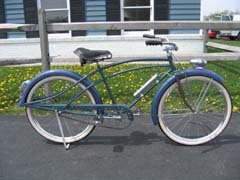 This Art-Deco bicycle was produced by the Huffman Manufacturing Company from 1936 to early 1937. 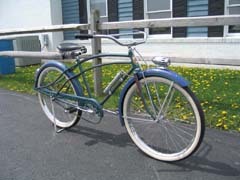 This bike is the only one known that was painted in this unique color scheme. 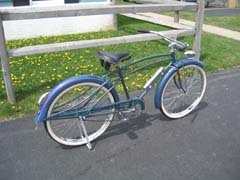 Earlier versions of this bike were called the “Safety Streamline” and were equipped with built in lights. 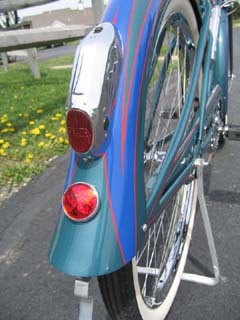 This model is equipped with a Delta Hornlite powered by the battery tube mounted on the frame, and a Delta Defender tail light on the rear fender. 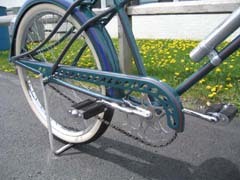 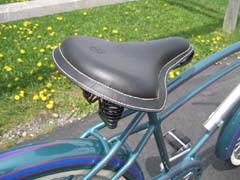 The saddle is a Mesinger Airflo with tornado shaped springs. 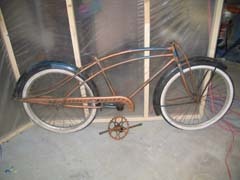 Owned by Jerry Berg in Napa, CA. 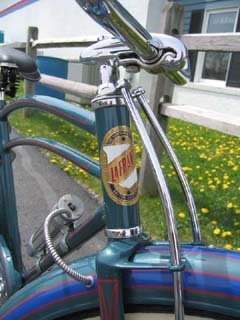 and restored by Dave Stromberger at Dave’s Vintage Bicycles (www.nostalgic.net).